It doesn’t take that much endurance to read a picture book aloud. Reading for longer periods of time, however, can be taxing, which makes the work that audiobook narrators do even more impressive. I started listening to audiobooks when I started driving to and from work; I used to commute via subway, where I found that external noise drowned out anything coming through my headphones. At first, not sure how much concentration I’d be able to spare, I started by re-reading books I’d already read, such as Philip Pullman’s His Dark Materials trilogy, which is performed by the author and a full cast. (It’s excellent.) I moved on to the Hunger Games trilogy, which Carolyn McCormick narrates (she is also excellent). Then I listened to Life by Keith Richards, read by Johnny Depp, Joe Hurley, and “Keef” himself; the switching between narrators seemed random and was somewhat jarring, but each individual reader was very good. Eventually, I started reading books I hadn’t read before, and I’ve become hooked on audiobooks; as soon as I finish one, I start another. Because my commute is blessedly brief and I’m usually only in the car for half an hour each day, I read a lot of shorter books (7-9 hours), often young adult novels. 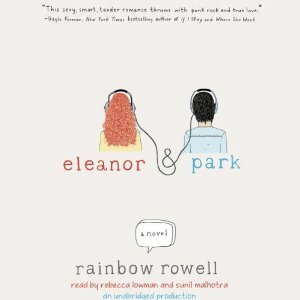 I’ve started seeking out particular narrators, such as Rebecca Lowman (Eleanor & Park, Rules of Civility) and Morven Christie (Code Name Verity, Burial Rites). One experiences a story differently, and remembers it differently, when hearing it read aloud as opposed to reading the text visually. Partly, audiobooks are a different reading experience for me because I don’t skip over sentences or skim paragraphs; I hear every single word. And a truly talented narrator can bring a book to life: listen to Jim Dale perform the Harry Potter books or Erin Morgenstern’s The Night Circus, or Rebecca Lowman read Eleanor & Park or Rules of Civility. Kate Rudd reading The Fault in Our Stars brought me to tears, though I didn’t cry when I first read the book in print. I think we are all hungry for stories, whether we read them to ourselves in print, listen to them as audiobooks, or read them out loud to ourselves or each other. 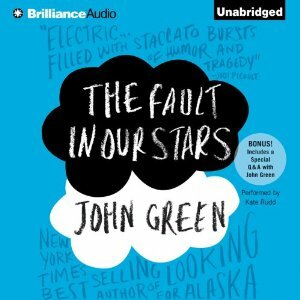 If you aren’t an audiobook devotee already, I’d encourage you to give them a try. Libraries usually carry them on CD and sometimes on Playaways, and they are often downloadable in mp3 format too. I have always been a fan of audiobooks – it is like being read to. Also it allows you to do other things (drive, crafts etc.) while reading. I had all the Harry Potter audiobooks growing up and Jim Dale is amazing. I didn’t know he did The Night Circus as well. I love that book I’ll have to check it out! I agree, audiobooks are great to listen to while knitting, cleaning, etc. – anything that requires your hands but not most of your concentration. I highly recommend the audio of The Night Circus – you’ll love it! Haha that’s awesome! But I would imagine it could be hard to get the read book smell in a perfume without overdoing the must.